The White House proposal to withdraw from the Intermediate-Range Nuclear Forces Treaty (INF) has been widely criticized, for good reason. Former military officials and diplomats have described the agreement as a “bedrock” of arms control. The 1987 treaty eliminated thousands of deadly medium-range missiles in Europe and helped to end the Cold War. The Trump administration alleges that the agreement is flawed and that Moscow is cheating, but if there is a problem, the answer is to try to fix the treaty rather than walk away from it. Scrapping the agreement would undermine international security, the former officials warn, and could prompt a new arms race in Europe. Progressives have also blasted the proposal. Win Without War director Stephen Miles said that abandoning the agreement could increase the risk of nuclear war and called upon Congress to deny funding for any weapons that violate the treaty. The INF agreement occupies a special place in peace history. The treaty was a response to and result of the massive nuclear-disarmament movements that swept across Europe and the United States in the 1980s. In some respects the peace movement owns this agreement, and we must do what we can to ensure it is not taken away. Let’s review the history. Beginning in 1979, as the Soviet Union deployed SS-20 missiles in Eastern Europe and NATO prepared to deploy new cruise and Pershing missiles in the West, millions of people took to the streets to demand an end to an accelerating arms race that put Europe in the nuclear crosshairs. In 1981 and again in 1983, massive protest marches occurred all across Western Europe—the largest rallies in postwar European history. In the United States, the nuclear-freeze movement spread like a populist prairie fire. Hundreds of cities and towns and nine states conducted public referendums calling for a halt to US and Soviet nuclear-weapons development. 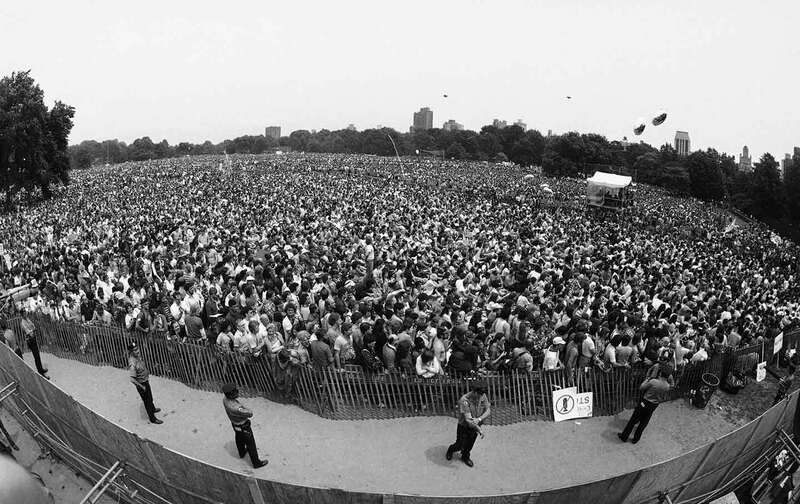 In June 1982 close to a million people converged on New York’s Central Park for the Rally to Freeze and Reverse the Arms Race, the largest peace rally in American history. The many citizen actions that took place on both sides of the Atlantic during those years put pressure on political leaders to respond. With European officials calling for negotiations, the Reagan administration agreed to open talks with the Soviet Union in the fall of 1981, much sooner than hard-liners had planned. Defense Secretary Caspar Weinberger told a meeting of Catholic bishops that the administration would not negotiate seriously with the Soviet Union until after the United States had “rearmed,” a process he estimated would take eight years. Yet, within months of taking office, the United States was at the bargaining table, driven in part by the political demands of the disarmament movement. Weinberger acknowledged in his memoir that antinuclear demonstrations generated pressure on NATO ministers to begin negotiations. Public protests also shaped the content of the negotiations. At the opening session of the talks, the United States and its NATO allies proposed the so-called zero option: the elimination of all intermediate-range weapons, on both sides. No SS-20s or cruise and Pershing missiles. The idea of the zero solution originated in the demands of the antinuclear movement. A State Department official told scholar-activist Mary Kaldor, “We got the idea from your banners. You know, the ones that say ‘No Cruise, No Pershing, No SS-20s.’” A senior White House counselor said the zero solution was “our response to the antinuclear people.” Weinberger also attributed the proposal to “a number of antinuclear groups” and political leaders in Europe. Many in Washington opposed the zero option and believed that cruise and Pershing missiles in Europe were necessary regardless of what the Soviet Union did. Secretary of State Alexander Haig told a National Security Council meeting in 1981, “We wouldn’t want a zero option even if we could have it.” Henry Kissinger and Richard Nixon later wrote that agreeing to the zero option would undermine security and lead to the breakup of NATO. Reluctant US officials nonetheless accepted the proposal because it was politically popular and provided a way of responding to and attempting to coopt the demands for disarmament. They presented the zero solution in the cynical expectation that the ossified leadership of the Soviet Union would reject the offer, which they did. The aging bosses of the Kremlin clung tenaciously to their missiles and refused to consider their elimination, thereby directly undercutting the peace movement. NATO leaders felt satisfied that they had outmaneuvered the transnational movement in the streets. They had offered the zero option but the Soviets had refused, so they were now free to proceed with cruise and Pershing deployments. The nuclear hawks had won the day, it seemed. The people in the streets refused to go away, however. Demonstrations and protests continued, despite the disappointment of not having stopped the missile deployments. Many organizers became policy advocates and worked on electoral and legislative campaigns. In the United States, activists worked with SANE, the Council for a Livable World, and other groups to pressure members of Congress for arms reduction, which generated political pressure on the White House for more flexibility at the bargaining table. The nuclear-freeze movement kept up a steady drumbeat for arms reduction. Then, in 1985, Mikhail Gorbachev came to power and launched his revolutionary program of perestroika at home and support for nuclear disarmament and peace in the world. During his 1986 summit with Reagan at Reykjavík, Iceland, Gorbachev signaled acceptance of the zero option, and Soviet and US negotiators promptly worked out the details. Moscow was finally saying yes to Washington’s offer. The zero option became reality. Soon afterward, I came to Germany to speak at a Green Party conference. I thought the party activists would be pleased by the treaty, but many delegates were confused and uncertain. They had lost the fight to stop the deployments in 1983 and did not recognize the broader impact of their activism in shaping the terms of the negotiations and creating pressure for peace. That’s a common experience in social movements. We often don’t see the effects of our work in the political processes that unfold in response to our action. Change usually does not occur as we expect, and there are setbacks along the way. But persistent pressure can have an impact, and is often decisive in setting the terms of political debate and generating pressure for change. It’s important to remember this history, and the significance of the INF treaty as an achievement for peace. It’s also important to generate renewed political pressure now to preserve the agreement and keep alive this vital legacy of the citizens’ movement for nuclear sanity.